It is ‘Shaiba’ (Saivite) pilgrimage and dates back to 7th – 9th centuries if not earlier. The marvellous rock carvings, murals with their primitive beauty, waterfalls are not to be missed. 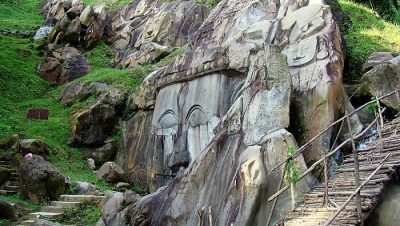 Unakoti means one less than a crore and it is said that these many rock cut carvings are available here. As per Hindu mythology, when Lord Shiva was going to Kashi along with one crore gods and goddesses he made a night halt at this location. He asked all the gods and goddesses to wake up before sun rise and proceed for Kashi. It is said that in the morning, except Shiva himself, no one else could get up so Lord Shiva set out for Kashi himself cursing the others to become stone images. As a result we have one less than a crore stone images and carvings at Unakoti. 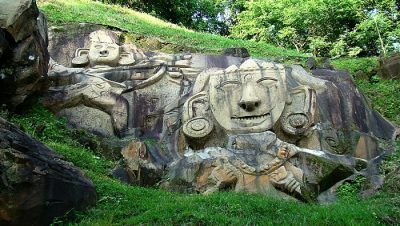 These carvings are located at a beautifully landscaped forest area with green vegetation all around which add to the beauty of the carvings. The images found at Unakoti are of two types, namely rock-carved figures and stone images. 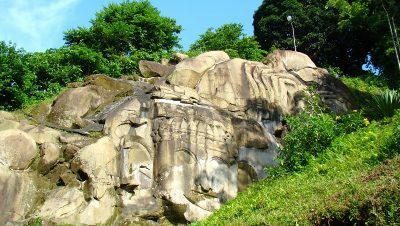 Among the rock cut carvings, the central Shiva head and gigantic Ganesha figures deserve special mention. 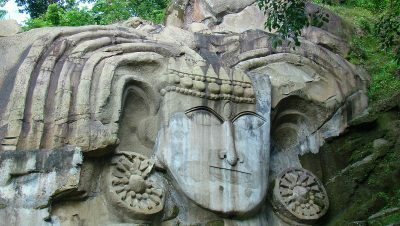 The central Shiva head known as ‘Unakotiswara Kal Bhairava’ is about 30 feet high including an embroidered head-dress which itself is 10 feet high. On each side of the head-dress of the central Shiva, there are two full size female figures – one of Durga standing on a lion and another female figure on the other side. In addition three enormous images of Nandi Bull are found half buried in the ground. 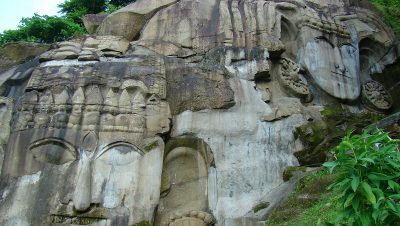 There are various other stone as well as rock cut images at Unakoti. Every year a big fair popularly known as ‘Ashokastami Mela’ is held in the month of April which is visited by thousands of pilgrims. Nearest Airport is at Agartala which is around 178 KM from Kailashahar by road. The place is around 8 KM from Kailashahar town. Nearest Railway Station is at Kumarghat which is 26 KM from Kailashahar. Bus, Autorickshaw and other small vehicles ply between Kailashahar and Kumarghat. The place is around 8 KM from Kailashahar town and around 22 KM from Dharmanagar by road. Nearest cities like Guwahati, Silchar, Shillong and Agartala is connected with Kailashahar by Bus and other small vehicles. The place is around 8 KM from Kailashahar town and around 22 KM from Dharmanagar by road. Unakoti Tourist Lodge (Kailashahar), Juri Tourist Lodge and Uttarmegh Tourist Lodge (Dharmanagar) and other private hotels at Kailashahar and Dharmanagar.